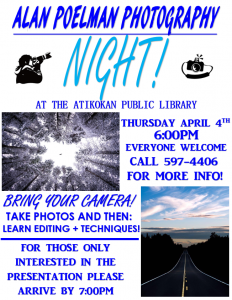 Thursday, April 4, 2019 at the Atikokan Public Library. Everyone Welcome. Call 597-4406 for more information. Bring your camera! Take photos and then learn editing & techniques. For those interested in the presentation, please arrive by 7:00pm.